BACKGROUND: Milium is native of southern Europe and western Asia first observed in North America in 1987. It has been found in winter wheat and pastures, and areas near those fields. Milium spreads by seed. 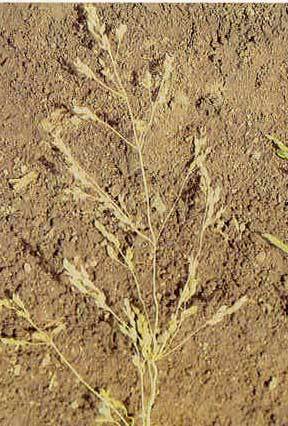 It has been a serious problem in winter wheat in Europe and is a threat in Idaho. DESCRIPTION: Milium is a winter annual grass that grows up to 2 1/2 feet tall. Leaves are up to 1/4 inch wide and 4 inches long, with veins and margins appearing roughened. Stems of plants in dense stands are weak and spindly, requiring adjacent vegetation to hold them upright. Ligules are 1/4 inch long and membranous; auricles are lacking. Panicles are open and up to 8 inches long, about 25 percent of the plant’s mature height. Spikelets are solitary on the tip of each panicle branch, 1/8 inch long, awnless, and contain a single hard, shiny seed. Seed heads appear in May, and seeds mature in June. The glumes (chaffy bracts that surround the seed) remain attached to the plant after the seeds fall. in Eurasia. In North America, it has been reported only in the indicated Idaho counties. CONTROL: Spring tillage appears to control milium. 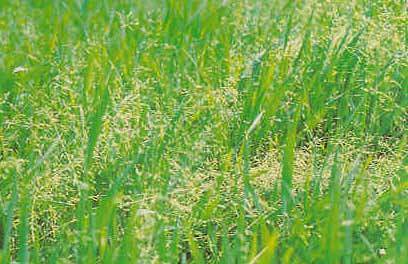 Herbicides are available, but there are no biological controls.